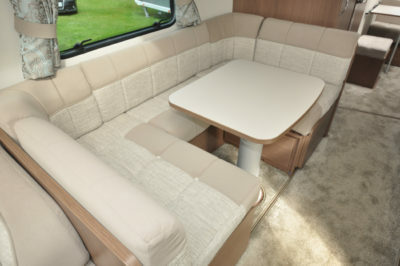 The Galera, from the Elddis flagship Buccaneer range is a six-berth twin axle that wants for nothing. Full family size, then? Definitely. But, it definitely looks the part, too, with its silver sides, graphite alloy wheels, heavy-duty corner steadies and automatic levelling system – all on a BPW chassis that many still consider a finer alternative to the altogether far more common Al-Ko offerings. 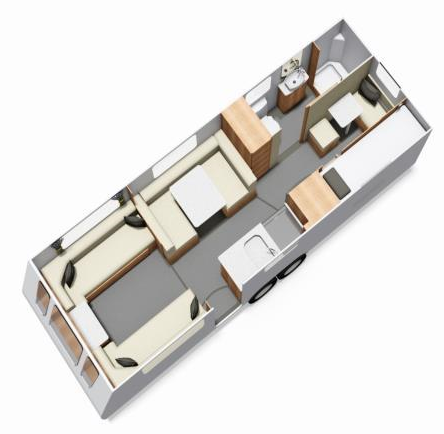 It still benefits from parent company Elddis’s SoLiD bodywork construction, with a more premium aluminium used for the sides. It’s some 8ft wide, too. Towing may not be for the faint-hearted, but you do have all the extra stability that a twin axle grants. It makes all the difference when you’re inside, though. It’s an interesting floorplan, with central U-shaped seating on the offside and two medium-length settees at the front. The back end is set up for kids, with two fixed bunk beds and a small seating/play area. 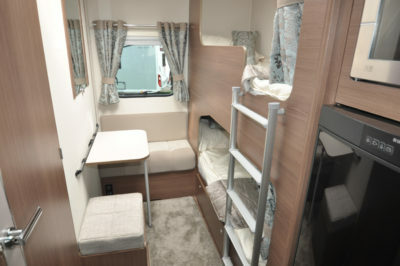 If you fancy the layout and are otherwise scared witless by the price (and weight), do take a look at Elddis’s Avante 866 (it costs about a third less). The Buccaneer Galera kitchen will definitely cater for the whole family. That’s a 155-litre Dometic fridge/freezer. 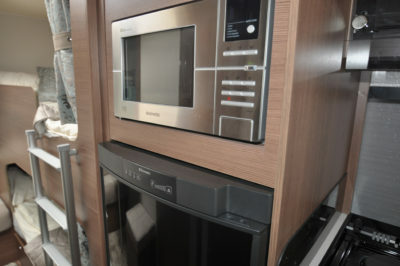 The Thetford Aspire 2 cooker is set far left, while the location of the sink – directly next to the hob, may not suit all – it does still leave some worktop, however. Plus, there’s a flip-up extension at the end. Note, also, the latest slimline Caraflo mixer tap. There’s also a drinks locker close to hand. 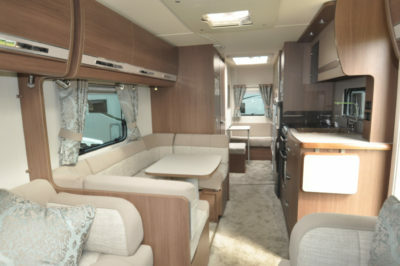 Unadulterated luxury is what this caravan is all about. You won’t be surprised to hear it has an Alde central heating system, which includes underfloor heating throughout, on a kit list that lacks for nothing. A mains power load monitor will save any embarrassment should you be making too much of the electrical facilities when you’re pitched (as well as what’s already on-board, there’s a plethora of mains and USB sockets). The 100 Watt solar panel on the roof is a definite plus, too. Needless to say, there’s still enough space above for a huge, opening sunroof. 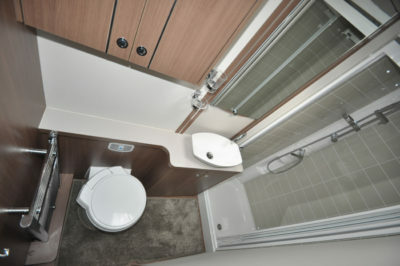 The washroom alongside includes a shower cubicle with tile-effect walling and an Ecocamel Orbit shower as well as a retractable clothes drier. There’s just the one double hook otherwise. Slightly surprisingly, too, extra shelving for the lockers still only makes it as far as the options list. Top spec’, top dollar. It’s a hefty unit, too. The ultimate six-berth British-built caravan, though? Arguably, yes. 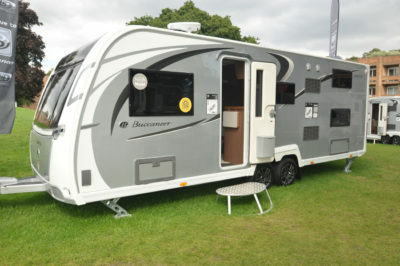 *Caravan insurance cost based on Buccaneer Galera caravan retailing at £32,194 fitted with hitchlock, BPW diamond wheel lock, Thatcham Cat 7 Tracker, PIR alarm and iDC. Kept on drive at HX4 0BE. Caravanners over 30 years old, claim free for 3 years and a member of a caravanning club. £100 excess. 180 days European cover and up to £75 per day for up to 15 days emergency accommodation cover included. Legal expenses cover, extended European cover and other emergency accommodation expenses cover options are available at extra cost. Quote includes 10% online discount and 10% Insurance Premium Tax and is correct as of 6.1.17. Owned a 2015 Cruiser, now own a 2017 cruiser. Cant fault them. Brilliant van. 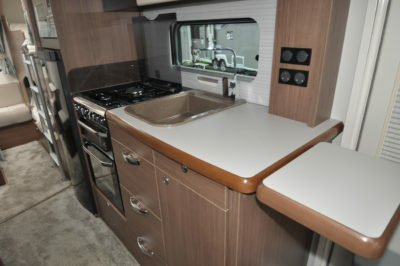 They must of got it right as the 8 footers across the Elddis range have sold like hot cakes! Thanks for sharing your feedback John. these caravans are too big, overpriced and most new vans are poorly built. My old van is dry and I will never buy new. Sorry to hear you’ve not had a great experience with this manufacturer Richard.